Make a baby sling wrap out of stretch cotton or jersey knit for a fraction of the price of a purchased one. Stretch cotton jersey (like tee-shirt material) is a great material for wrapping a newborn. I personally only like stretch jersey for carrying babies up to about 15 pounds so there is no way I'll pay full price for a cotton knit wrap when I'll only use it during the first few months. (after that I use sturdier cotton woven wraps like storchenwiege, didymos or other brands) Time to hit the fabric store! 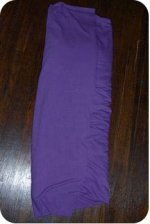 I found this purple stretch cotton jersey in the clearance section of my local fabric store for just $3.00 a yard. I purchased 4 yards so total spent is just $12 for a wrap, plus I have extra fabric or an entire extra wrap! Length Options: Most women can do all carries with between 4 and 5 yards depending on their size. I know from experience that 4 yards is just enough length for me but when in doubt buy extra! If you find you purchased too much you can easily chop off the additional and use the fabric to make baby clothes or sew cloth baby toys or even make a skirt for yourself. Width Options: Above is the full width of my fabric with a purchased wrap on top of it so you can see the difference in width. 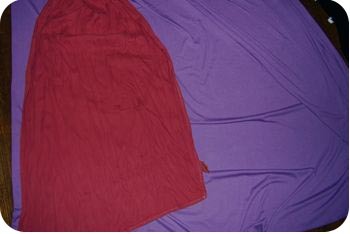 The purchased wrap shown is 25" wide, roughly half the width of the fabric I purchased. Most wraps are between 25-30" wide. Most fabric off the bolt is 40" and wider. The width you cut your fabric is entirely up to you, but no smaller than 20" is standard. I prefer about 25" for stretchy cotton wraps with newborns. Wider is better for back carries but if you do not plan to carry your newborn on your back then you will be fine around 25". For back carries I prefer at least 30" width but I do not find back carries comfortable with cotton stretch wraps. How to: To make a baby sling wrap out of cotton jersey is so easy you don't even need to sew anything! The fabric I purchased when cut did not fray and was just fine as is, it even rolled up at the edges a bit and hid the unfinished edge. I didn't taper the ends so there was nothing to sew. I cut the fabric in half so the width was about 25" and then I had a wrap. Actually, I had two wraps since I was simply cutting it down the center. This extra one you can give to a friend, make something else with it or it is very handy to have a back up during those early weeks when there is a lot of spit up and poop explosions all over your wrap. When you make a baby sling you might as well make two! Toss one in the wash and use your identical backup! When your child gets too heavy and you've moved onto a more supportive wrap (or different carriers) you can use the wrap as fabric. Check out our free baby clothing patterns for some project ideas to use up your fabric leftovers. The baby (um, actually he is a toddler now but I don't like to admit that) pictured above is simply to darn heavy to comfortably wear in a stretchy wrap but I needed a model. My original cotton baby wrap that I made with my first newborn has long been passed onto a friend. One half of this new purple one was given to yet another friend and the other half used for sewing projects! For wrapping & wearing instructions - please go to thebabywearer.com's huge list of instructions posted all over the web. 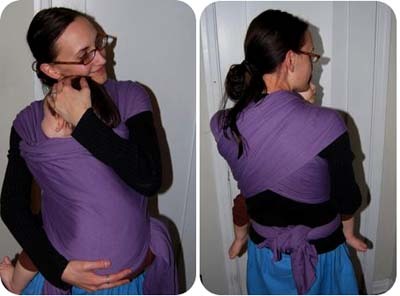 Here is an excellent pouch sling pattern if you are intimidated by all those layers in a wrap! Go to the Make Baby Carriers Section for more project ideas! Back to the top of the Make a Baby Sling Wrap page.